Before setting off for work today Mr LMR burnt a hole in our living room rug. The joys of having an open fire. I spent 20 minutes discussing how Middle Monkey could not get dressed because the only part of the room he wanted to dress in was too cold. I was also engaged in a session of rememising over old peices of art work and birthday cards produced by Top Monkey who was rummaging around in the recycling cupboard. I texted a work colleague and friend about the hole in the carpet. As if to excuse another late arrival at work. Her response? “Never a dull moment in your house!” Quite. I often ponder the craziness of my life and wonder if we are “normal”. Then I write a blog post about it and lots of people respond to say “phew, I thought it was just me.” So is not normal actually the new normal these days? In my life a normal day involves my navigating a number of obstacles. Most of which cannot be predicted or avoided. For example, the other day everything stopped because Top Monkey could not find the correct hair for his Lego man. In order to restart our day I was required to sift through the Lego box to find said hair. Not an easy task I can tell you. After 20 minutes of finding hard hats, crash helmets, a pony tail and a headdress in the shape of a snake skull, amongst other things, said hair was located. Our day resumed. 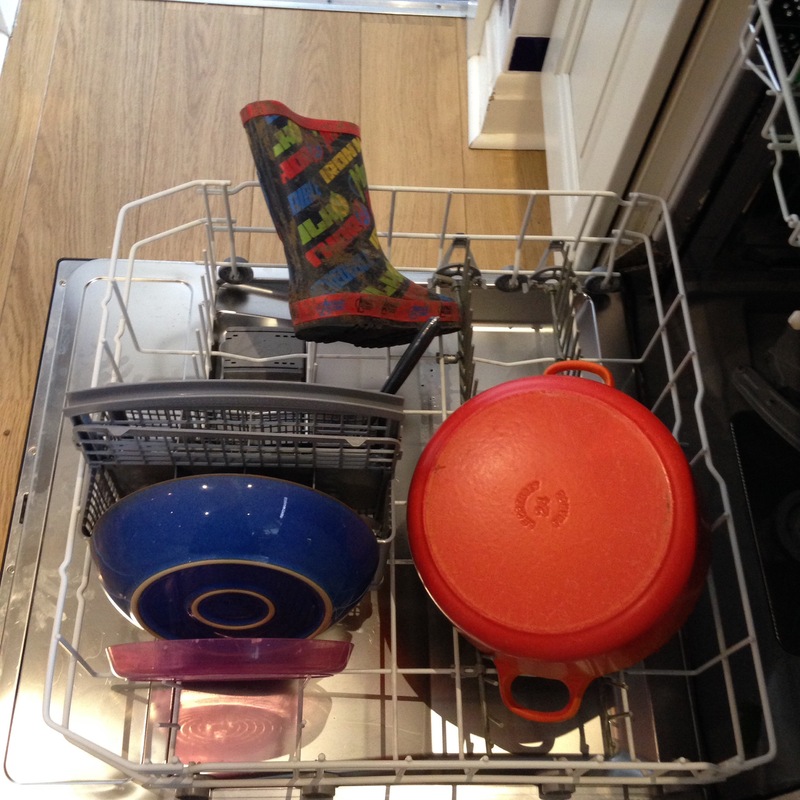 Sometimes there is a welly in my dishwasher or a fish on my washing line. There is a hole in the wall by my backdoor where Top thought he would try rock climbing and bashed a first hand hold with a gardening tool he found in the garage. 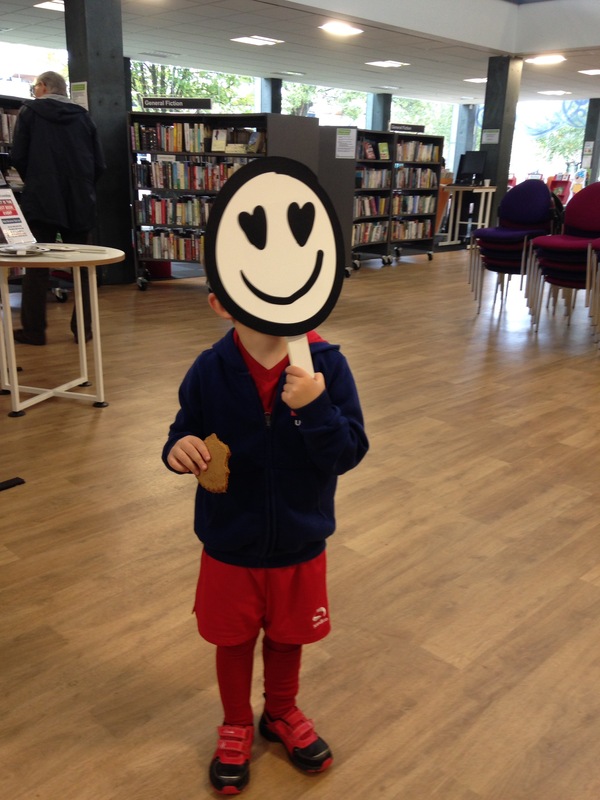 “What the bleep is this?” Mr LMR exclaimed when he found it. Sometimes it’s funny, sometimes it really isn’t. You learn to go with the crazy and try to laugh at the things that, at the time, seem unforgivable. Remember the hole in my rug? I’ve had to learn to let things go in order to hang on to a little bit of sanity. Parenting is like falling down the rabbit hole into Wonderland. You’re either a confused Alice or a happy hatter at a tea party. The other day Middle Monkey made me a “teddy”. 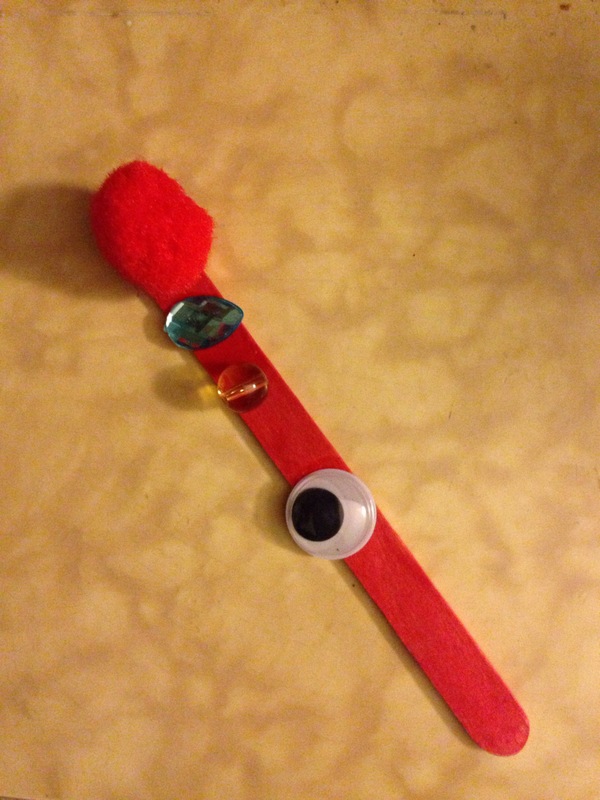 Or also known as a red stick with one eye, a red pompom and a couple of jewels on it. He was so proud of it. Tonight he brought it to me when I got home from work. “Look mummy it’s all dry now. Do you like it? Show me you like it. Give it a cuddle”. Cue me trying to cuddle a stick. “Ah that’s nice, you can cuddle it all night now.” Off he went happy. Problem is, if I don’t take the stick to bed with me tonight and he catches me out it will be big trouble in the morning. Better to embrace the stick. So this is my normal now, cuddling sticks, wellies in the dishwasher, burn marks on the rug courtesy of a sleep deprived Mr LMR. Rug aside, I don’t mind my new normal too much. Of course I would like it if we could navigate life without Lego hair delaying our plans or if the monkeys would poo at more convenient times. But it isn’t a deal breaker and later when we’re on our own Mr LMR and I can often be found crying with laughter. Reliving what they’ve said or done. By the standards of others, maybe we aren’t normal. I work hard to keep them safe and well fed, to teach them good behaviour and know when things aren’t right. But I don’t think I’ll ever teach them to judge themselves by the normal of others. I used to run to feel normal again. Now I run to feel prepared for our normal. Which is pretty normal after all. <3 love this, especially the welly..